The downside of being a grown-up is not limited to having to pay the bills yourself. Many times, you have to yield the fun to the younger ones just because you’re an adult. If you miss good ol’ days when you could beat all the stress simply by jumping on a trampoline, visit this playground where you can go back to childhood – on an adult level. Sports Monster, located in Hanam-si and Goyang-si in Gyeonggi-do, is the first-ever “sportainment” theme park. Nestled in the Starfield malls, Sports Monster is a unique space where sports and entertainment are well blended. The park is divided into four sectors – Basic Zone, Exciting Zone, Adventure Zone, and Digital Zone. 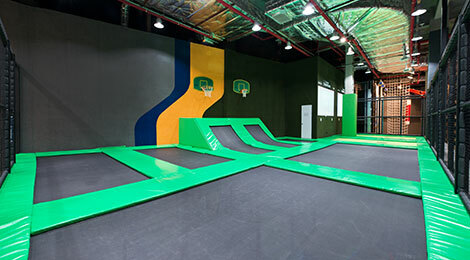 In Basic Zone, you can play various sports with your friends and family in stylish indoor courts. If you want extra entertainment, go to Exciting Zone where you can jump on a trampoline up to 4 meters or shoot razor guns. If you need something more dynamic, skip everything and run to Adventure Zone. 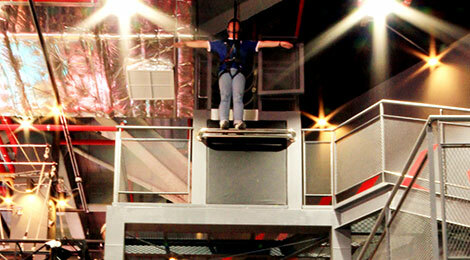 This sector is filled with thrills that range from rock climbing to an 8-meter free fall. 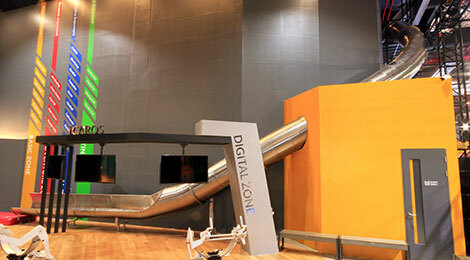 Last but not least, Digital Zone is where you can have fun and gain some muscles at the same time, using digital equipment. Admission for adults is 23,000 KRW and 18,000 KRW for teenagers and children. You can also sign up for a year membership for 350,000 KRW. Visitors can use facilities for two hours, with an additional 1,000 KRW charged for each additional 10 minutes. Take a look at the list below for the key facilities. Zip-line around the facility. Watch out for the curves!